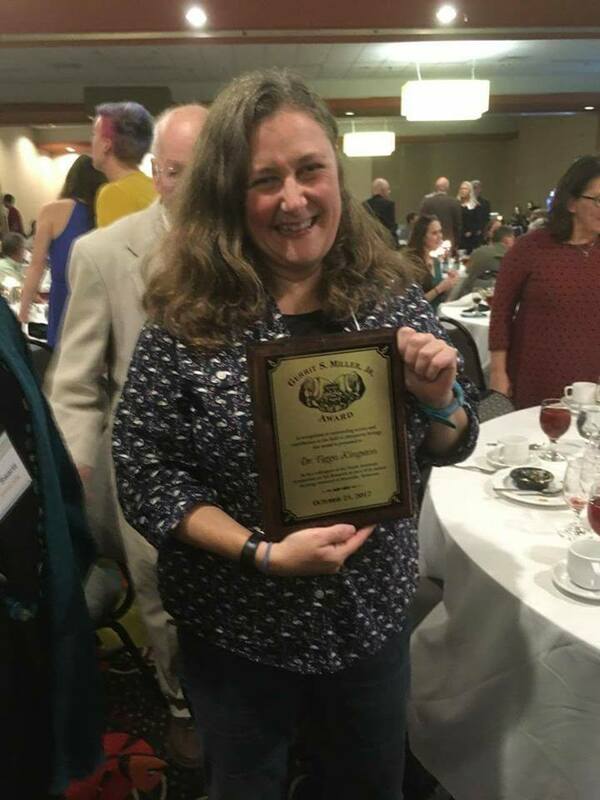 I was deeply honored to receive the Gerrit S. Miller, Jr Award from the North American Society for Bat Research at NASBR’s annual conference last week. 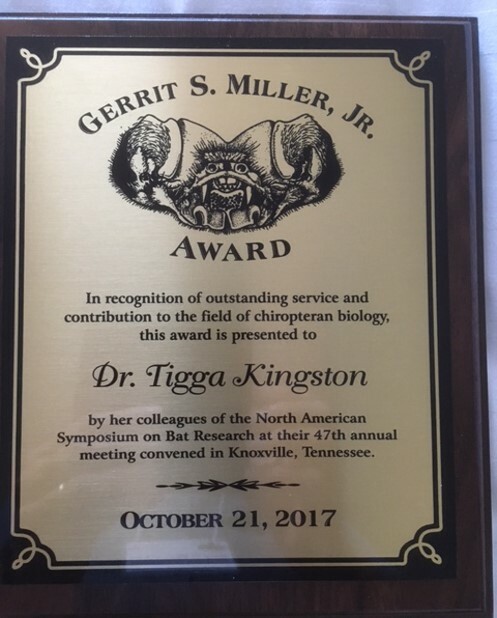 The award is in recognition of “outstanding service and contribution to the field of chiropteran biology”. I am the 26th awardee in the Society’s 47-yr history, so it is very special to me! One of the best bits of the award is the complex conspiracies that go on to keep it a secret from the recipient until “the big reveal” at the conference banquet. Thank you to all the co-conspirators for making it so special — you know who you are!!! We are pleased to announce that applications to the 2018 Kate Barlow award are now open – the closing date is 5pm, 4th December 2017. 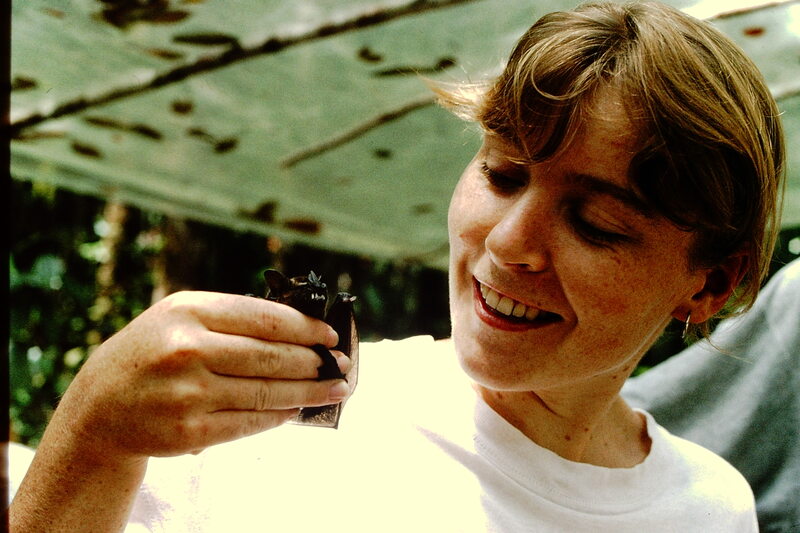 The Kate Barlow Award aims to encourage the next generation of bat researchers by providing a substantive contribution towards the research costs of postgraduate students undertaking research that will benefit bat conservation, in honour of the late Dr Kate Barlow’s contribution to bat conservation. The Kate Barlow Award is open to students anywhere in the world conducting research which has a direct relevance for bat conservation. One award of up to £4,500 will be made, towards the costs of a bat research project of no less than 4 months duration. In addition BCT will pay for the award winner to attend either the BCT National Bat Conference or another relevant bat research and conservation conference. An award decision will be made by the end of February 2018. The McGuire lab at Texas Tech University is looking for a highly motivated PhD student to work as part of an NSF-funded collaborative study of flying foxes and Hendra virus in Australia. The successful applicant will work with an international and multidisciplinary team of collaborators, seeking to understand how human influences affect Hendra virus spillover events. As human development clears native forest resources, flying foxes that are traditionally nomadic or migratory have increasingly established permanent resident camps in urban and peri-urban areas. The PhD student will lead efforts to study the nutritional ecology, foraging dynamics, energetics, and stress physiology of resident flying foxes compared to migratory populations. Experience working with bats is an advantage, but more important is experience with ecophysiology methods such as energetics, nutritional physiology, and stress physiology. Fieldwork will extend for periods of up to 1 year in Australia, and therefore the successful candidate must be independent, motivated, and well organized, able to work well with a large team of collaborators under challenging field conditions. Another PhD position related to the project will be available in the Plowright lab at Montana State University, focusing on immunology and virus dynamics in flying foxes. Anticipated start date for the position is January 1, 2018. For more information about the project, contact Liam McGuire (liam.mcguire@ttu.edu). The position will be based at Texas Tech University in Lubbock, Texas, but extended periods of fieldwork will be conducted in Australia. Interested students should send a CV and brief summary of relevant experience to Liam McGuire (liam.mcguire@ttu.edu). I am the guest editor for a special issue in the journal Diversity entitled “Diversity and Conservation of Bats”. Submissions are due before 31st March 2018, so plenty of time to pull together some great papers! The scope address the following: i) the diversity and distribution of bats; ii) the effect of human activities (e.g., landuse change, hunting, roost disturbance, climate change) on bat behavior, populations, diversity, distributions, or ecosystem function; iii) drivers of human activities that threaten bats (e.g., attitudes, knowledge, perceptions, economics); and iv) conservation applications, particularly those that evaluate evidence of success. Kendra recently published in the journal and had a good experience with them. Once the article is accepted, it is up in the issue almost immediately, and the review process was also very efficient. So, I look forward to seeing submissions. Kendra has a paper out today, with lead author Anna Willoughby and Kevin Olival from Ecohealth Alliance, in Diversity exploring the role of roosting ecology in patterns of viral richness and sharing among bat species. The authors compiled bat-virus associations (from previously published databases) and ecological traits to investigate the importance of roosting behavior on viral richness and sharing. Cave-roosting bats do not host greater viral richness than non-cave-roosting bats, but do exhibit a greater likelihood of sharing viruses, especially between species documented as co-roosting in the same cave. Marina’s first publication from her dissertation research is online today — congrats! Marina and undergraduate co-author Rebecca Wilson pulled together and cleaned a huge dataset of Southeast Asian GBIF records. Perhaps not surprisingly, Southeast Asian bat sampling effort is spatially biased, most notably by distance to protected area. However, ecology also plays a role, with bias varying among foraging groups. A particularly novel contribution to the field was examination of how bias changed through time. The paper is OPEN ACCESS until July 5th. Marina Fisher-Phelps, Guofeng Cao, Rebecca Wilson and Tigga Kingston. (2017) Protecting bias: Across time and ecology, open-source bat locality data are heavily biased by distance to protected area. Ecological Informatics 40: 22-34. https://doi.org/10.1016/j.ecoinf.2017.05.003. ** NOTE the current pdf on the Ecological Informatics site is missing a table. It is present in the online version. This will be corrected soon. Marina did a great job on her defense yesterday, successfully defending her dissertation entitled “Modeling Southeast Asian Bat Distributions: Assessing the Effect of Ecology and Spatial Biases on Model Accuracy”. The first data chapter is in revision for Ecological Informatics. Thanks to her committee members Nancy McIntyre, Dylan Schwilk, Guofeng Cao, and Rich Strauss for their service and support of Marina. Thanks also to Blake Grisham for acting as Dean’s Rep.